We’d love your help. Let us know what’s wrong with this preview of Notes from a Young Black Chef by Kwame Onwuachi. To ask other readers questions about Notes from a Young Black Chef, please sign up. Am I biased?? MAYBE, but so what!!! We don’t get many black chef memoirs and I gobbled this up like I was a hungry bear! The story was wonderful, tantalizing, a filling course of the best foods and I tell you I still want more. It’s funny how I was reading two very different stories by two very different men named Kwame— 💚. This particular memoir is not your Normal “rags to riches” but rather a gathering of life’s lessons to become someone and something that was kind of unfathomable— a freakin c Am I biased?? MAYBE, but so what!!! We don’t get many black chef memoirs and I gobbled this up like I was a hungry bear! The story was wonderful, tantalizing, a filling course of the best foods and I tell you I still want more. It’s funny how I was reading two very different stories by two very different men named Kwame— 💚. This particular memoir is not your Normal “rags to riches” but rather a gathering of life’s lessons to become someone and something that was kind of unfathomable— a freakin chef! And it didn’t take long for him to find his niche. I am compelled to travel to DC to go to his restaurant, see the African American Museum and come back to my Coast all in a weekend. This was an excellent food memoir. I admired Kwame when he was on Top Chef and thought his food looked and sounded amazing. I didn’t realize that his first restaurant closed soon after Top Chef aired. Kwame brings up a lot of relevant issues with race in the restaurant industry. While I think mistakes were made in the opening of his restaurant (pricing of the menu as well as not vetted partners), he raises valid points as to what people expect from chefs who are not white and how easy it is to b This was an excellent food memoir. I admired Kwame when he was on Top Chef and thought his food looked and sounded amazing. I didn’t realize that his first restaurant closed soon after Top Chef aired. Kwame brings up a lot of relevant issues with race in the restaurant industry. While I think mistakes were made in the opening of his restaurant (pricing of the menu as well as not vetted partners), he raises valid points as to what people expect from chefs who are not white and how easy it is to be pigeon holed into their background. Lastly, I loved that he talked about his love of Harry Potter mixed in with all his experiences. I hope to try his restaurant next time I’m in DC and wish him the most happiness and success. I enjoyed this book very much. Kwame Onwuachi has a powerful and timely story to tell, and I was riveted by his experiences. 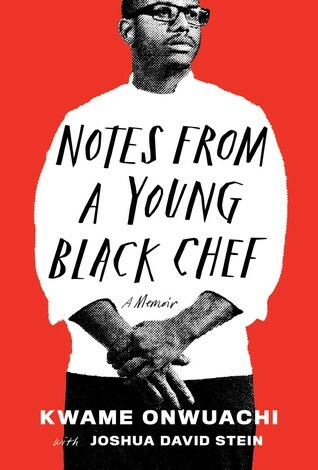 In a way, all you need to know before you decide whether to read this book is right there in the title: he's young, he's black, and he's a chef. Young: Onwuachi has had a busier life than some people twice his age, but I admit to sometimes rolling my eyes when he expresses dismay at his own youthful exploits -- "Oh, I was so young and naive then!" It's like, dude, it was on I enjoyed this book very much. Kwame Onwuachi has a powerful and timely story to tell, and I was riveted by his experiences. In a way, all you need to know before you decide whether to read this book is right there in the title: he's young, he's black, and he's a chef. Young: Onwuachi has had a busier life than some people twice his age, but I admit to sometimes rolling my eyes when he expresses dismay at his own youthful exploits -- "Oh, I was so young and naive then!" It's like, dude, it was only 2 years ago and you are still not even 30. Black: Onwuachi's identity as a black man, and specifically as a black man from NYC with family from the American south (mother's side) and from Nigeria (father's side), is central, and important, and very interesting to read about. Chef: This book is an entry in a long line of chef memoirs that will satisfy lovers of the genre. Onwuachi's culinary career trajectory, and how it has intersected with his more personal journeys, is the stuff of food world legend. And the fourth word in the title? Notes. While none of the chapters read like fuzzy sketches, I would say that each one strikes a separate thematic note. The book goes more or less in chronological order, but not entirely. Some chapters do repeat bits of information and parts of anecdotes already covered in other chapters. One more editorial criticism is that there are a few factual errors in the book that kicked me right out and also made me wonder about the truthfulness of other, less provable things. For instance, in NYC, the Union Square Barnes & Noble is NOT on 14th Street, it's on 17th Street. If Onwuachi (or Joshua David Stein, or the editors) didn't check that, what else did they not check? "By the time he was twenty-seven, Kwame Onwuachi had competed on Top Chef, cooked at the White House, and opened and closed one of the most talked about restaurants in America." (source) These incredible accomplishments were in part possible due to the influence of his family. His mother inspired his love of cooking from a young age, passing on family recipes with origins from the bar hi Summary: This was a thoughtful memoir that tackled issues of racism head-on, but I wanted a little more depth. "By the time he was twenty-seven, Kwame Onwuachi had competed on Top Chef, cooked at the White House, and opened and closed one of the most talked about restaurants in America." (source) These incredible accomplishments were in part possible due to the influence of his family. His mother inspired his love of cooking from a young age, passing on family recipes with origins from the bar his grandparents ran as a safe gathering space for black people in 1960's Texas to recipes reflecting his father's Nigerian origins. Throughout his life, his family shared food with love and his realization that he could provide this experience for other people started him down the path towards becoming a professional chef. Along the way, he had to overcome barriers shaped by racism and classism from his school years through his time in some of the most renowned American kitchens. The only other celebrity memoir I've read that acknowledges a co-author was I Am Malala and there I felt the tug-of-war between the journalist co-author and Malala's younger-sounding voice. There was no such conflict here. I thought Kwame's story was presented well, in a single, consistent tone. His passion, his nerves, his humility, and his ambition came through in a really balanced way. Personally, I also thought he used precisely the right amount of profanity to emphasize the things that mattered most to him. For all that I thought the author presented his emotions really well, the only times I felt emotionally engaged by this book were when he was talking about the racism he experienced. I thought it was heartbreaking and infuriating that at 10 years old, he could tell that his teachers saw him as more of a threat than his white peers. I thought the same thing when, as a successful adult, he still had to endure poor treatment by both a cop and a supervisor due to his race. These are incredibly important stories and I admired the forthright way he discussed the racism he's encountered. I wish other parts of his story had drawn me in just as much. I think one reason I wasn't drawn into this story more was that the writing felt a little light. In the prologue, there was a wonderful section where we learned about the history of the food Kwame was creating. I would have loved more of this. As is, we got some fantastic bits on his personal connection to the food later on, but little history. 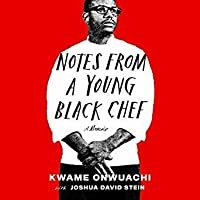 As someone who doesn't know much about cooking higher end food, I'd also have liked more details about what Kwame learned. Again, we got bits of this, as when he discussed the technique for creating a consommé, but I wanted information like this for so many of the other meals he cooked. The author did make some very insightful observations about his life. I particularly admired his discussion about how he has always shaped his appearance to the extent he could, given preconceptions about him because of his race and gender. This was a theme throughout, from his splurging on nice clothes as teen to his comfort with putting on a persona for Top Chef, since moving through the unwelcoming world of haute cuisine required him to do the same every day. I wanted more of this too. That was definitely my main complaint with this book and not the worst problem to have! I was so excited to receive this ARC for early review! Being a self proclaimed foodie I couldn't wait to devour (haha) this one. It didn't disappoint. I had not heard of Onwuachi before, though I have watched both Iron Chef and Top Chef in the past (I guess not his season...). I loved hearing about how Onwuachi got to where he is in the food world. This guy worked his tail off to achieve his successes! I am impressed with his street wise and work ethic, especially his not wanting to berate and belittle his staff like so many other Chefs do. That is admirable and reflective on the kind of person he is. The recipes at the end of each chapter is a cozy and sweet touch to the memoir, though I don't think I'll ever really try them as they look to me to be a bit involved! I'm a foodie, remember, not a fellow chef! This was a well written book, the details he shares with his readers are calculated and fit in the smoothness of transition from one life chapter to the next. The stories he tells shapes and molds who he believes he is as a person, or wants us to know of him, and they make him out to be respectable, endearing, and hard working. I would totally save up to eat at his restaurant some day for sure! I love his tenacity and refusal to stoop to cliched stereotypes. This memoir is written during a really interesting period of the author's life: right after his first well-hyped restaurant closed. I read that he had already started the book before that happened so at first I wished this had included his eventual success with his current restaurant, but it's probably a more fascinating narrative to reject the redemption arc. This is especially true in light of the book's questions about who is allowed to par Thanks to the publisher for an advance reader's copy. In Notes From a Young Black Chef, Kwame Onwuachi shares his upbringing, and the story of his life so far with us through words, while also telling us about how he found his voice as a chef by telling his life story through his food. Chef Onwuachi is still young, but the life has already lived feels expansive. Kwame’s authenticity shines through in this memoir. It takes a lot of guts and strength to tell the whole truth even the ugly parts. I highly recommend this book. It truly is a must read. Through each chapter you’re informed of how race and class truly touched every part of his aspirations. This book is something i will revisit for sure. Through most of the book I caught myself waiting for Kwame to cook. That stopped once I realized he was simply putting into words the courses he carefully crafted out in Bijou and the Dinner Lab. The first half is about his past, his childhood that is filled with smells and flavors and sounds of his mother and sister in the kitchen. His story is heartbreaking and amazing and I deeply admire his hustle and determination to make a name for himself. I wish that the writing was more clear. There were Through most of the book I caught myself waiting for Kwame to cook. That stopped once I realized he was simply putting into words the courses he carefully crafted out in Bijou and the Dinner Lab. The first half is about his past, his childhood that is filled with smells and flavors and sounds of his mother and sister in the kitchen. His story is heartbreaking and amazing and I deeply admire his hustle and determination to make a name for himself. I loved this book from the very fist pages. Diving into the heart of Kwame Onwuachi was a ride both beautiful and heart wrenching. I've known so many young men with backgrounds and dreams similar to Kwame's and I couldn't help but see their faces and their ambitions in every word I read. His story was a fascinating tale that took me from highs to lows to new highs. It was an emotional roller coaster always rooting back in the beauty, comfort and complexity of food, how and what we eat or share w I loved this book from the very fist pages. Diving into the heart of Kwame Onwuachi was a ride both beautiful and heart wrenching. I've known so many young men with backgrounds and dreams similar to Kwame's and I couldn't help but see their faces and their ambitions in every word I read. His story was a fascinating tale that took me from highs to lows to new highs. It was an emotional roller coaster always rooting back in the beauty, comfort and complexity of food, how and what we eat or share with others. Never watched 'Top Chef' or heard of him before but was intrigued by the cover and title and the story on how author Onwuachi became a chef and the road he took to get there. We follow his life and times, career with all its highs and lows and what it's like being a Black man navigating a culinary world that is dominated by people who, well, don't look like him. Unfortunately he wasn't served well by his co-author. The writing is...pretty pedestrian. It's a pity because he has a really interestin Never watched 'Top Chef' or heard of him before but was intrigued by the cover and title and the story on how author Onwuachi became a chef and the road he took to get there. We follow his life and times, career with all its highs and lows and what it's like being a Black man navigating a culinary world that is dominated by people who, well, don't look like him. Unfortunately he wasn't served well by his co-author. The writing is...pretty pedestrian. It's a pity because he has a really interesting story and I'll bet there will be plenty of people who would enjoy it but I thought the writing was really bad. I'm not sure how talking about spending time in both New York and Nigeria could be such a slog to read but unfortunately it was. Which is not to say there isn't value to the book or Onwuachi's story. I just don't feel he was served very well by his co-author. If you're interesting in similar books, I recommend Marcus Samuelsson's 'Yes, Chef'. This book was so fascinating. I have never watched Top Chef nor have I ever worked in a kitchen so I walked into this book with no idea what to expect. The voice of the storytelling was compelling and succinct, and yet so full of detail I could envision it all. It was beautiful, heartbreaking, and so well described that I felt like I was able to see what he was seeing. His honest descriptions of people and events showed that people are both good and bad, situations can go how you want and how yo This book was so fascinating. I have never watched Top Chef nor have I ever worked in a kitchen so I walked into this book with no idea what to expect. The voice of the storytelling was compelling and succinct, and yet so full of detail I could envision it all. It was beautiful, heartbreaking, and so well described that I felt like I was able to see what he was seeing. His honest descriptions of people and events showed that people are both good and bad, situations can go how you want and how you don't but continuing to put one foot in front of the other is so important. I would definitely recommend and read anything else Kwame Onwuachi comes out with. I also loved that each chapter had recipes at the end of them that connected so well to the story. They sounded complicated but also seemed so approachable. I love you, Jaquan. What an amazing friend indeed. I read this in just a couple of days-Kwame Onwuachi shares all of his struggles, mistakes, hustles and grit in this moving memoir (which also inspired me to check out some fine dining spots myself!). “I lear I love you, Jaquan. What an amazing friend indeed. 29 strikes me as really young to write a memoir that names names in a relatively small industry where everyone knows each other and is so reliant on connections and who knows who. But, a memoir that doesn't name names probably doesn't get the media attention this one is getting. And on the upside, addressing racism in the industry is critical if it's ever going to change so hopefully Onwuachi's honesty helps propel the conversation and changes in kitchens. I liked the book and Interesting, but. Chef Kwame tells his story from his early Bronx years to his time on television, from his high school days to his rocky role as a chef at a high priced ill-conceived concept restaurant. He tells his story, though, as if he were watching a play with a character named Kwame as the protagonist. There’s something dispassionate about the telling. Also, I feel there’s not a real understanding or accountability from him. I give his poor mother a lot of credit; the woman tried so hard to raise him to be Chef Kwame tells his story from his early Bronx years to his time on television, from his high school days to his rocky role as a chef at a high priced ill-conceived concept restaurant. I give his poor mother a lot of credit; the woman tried so hard to raise him to be a respectful responsible young man. And from what I read, she’s succeeded. I received a copy of this ebook from firsttoread.com in exchange for an honest review. This is a short and interesting read. Following Onwuachi from his childhood selling candy to pay for his first catering company to the opening of his restaurant in DC this is a fascinating read. I didn't realize Onwuachi had been on Chopped and would have liked a bit more in depth about his success as a chef and what that means for him now. The book is relatively short and shares a compelling story about identi I received a copy of this ebook from firsttoread.com in exchange for an honest review. A good book overall. Kwame Onwuachi's life story is fascinating, his experiences with racism in the fine dining world infuriating, and his candor welcome. But as a Top Chef fan, I was very disappointed by the scant attention his experience on the show received. Don't pick this up, as I did, expecting for an account of life on the show or any other sort of a backstage view of Top Chef. It is talked about in terms of the chronology of Onwuachi's life, but that's about as far as this book goes. This was not the usual chef memoir. Living outside the US, I didn't know the TV show nor had I read anything about the author, but he has had quite the memorable life so far and he isn't even 30! If I lived in DC, I'd be eating at his restaurant tomorrow. Could not put this book down. Inspiring story. Loved his experiences at the CIA and his time at Top Chef. I had no idea that I would like this book as much as I did. From the first chapter to the acknowledgements at the end, I was hooked. This is an absolute must read. Kwame has overcome many obstacles and his strength and perseverance is remarkable and inspiring. Kwame Onwuachi is the executive chef at Kith and Kin and owner of the Philly Wing Fry franchise in Washington, D.C. He was born on Long Island and raised in New York City, Nigeria, and Louisiana. Onwuachi was first exposed to cooking by his mother, in the family’s modest Bronx apartment, and he took that spark of passion and turned it into a career. From toiling in the bowels of oil cleanup ships Kwame Onwuachi is the executive chef at Kith and Kin and owner of the Philly Wing Fry franchise in Washington, D.C. He was born on Long Island and raised in New York City, Nigeria, and Louisiana. Onwuachi was first exposed to cooking by his mother, in the family’s modest Bronx apartment, and he took that spark of passion and turned it into a career. From toiling in the bowels of oil cleanup ships to working at some of the best restaurants in the world, he has seen and lived his fair share of diversity. Onwuachi trained at the Culinary Institute of America and has opened five restaurants before turning thirty. A former Top Chef contestant, he has been named a 30 Under 30 honoree by both Zagat and Forbes.